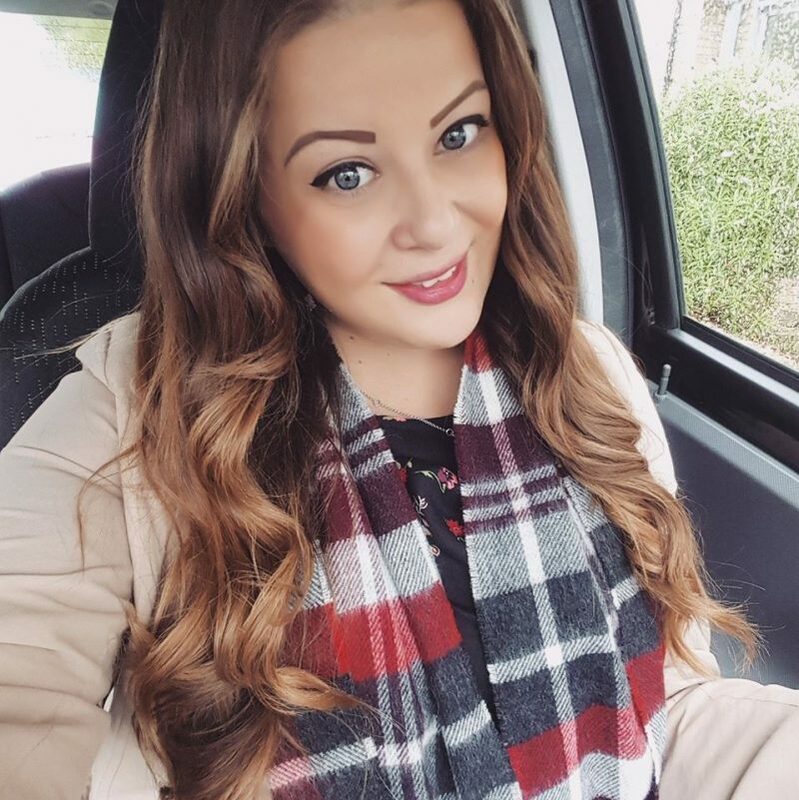 I was recently asked by Safestore if I would be interested in taking part in a little blogger project they are running in collaboration with their charity partner Scope. Scope are a fantastic charity who work with disabled individuals and their families, providing support, advice, short breaks and much more. 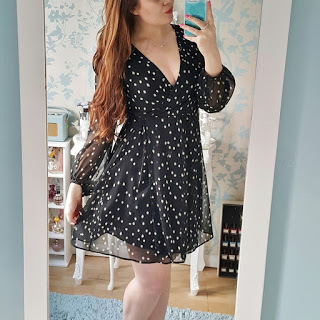 I was invited to blog about my recent charity shop treasures so of course I was interested in taking part as I love a bit of charity shop hunting! 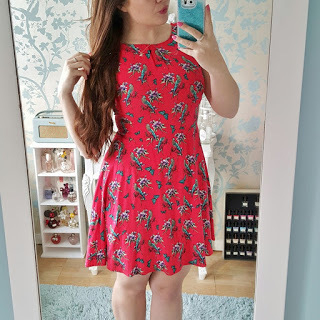 I thought I’d also share a few of my charity shop hunting tips too, because I know a lot of people tend to shy away from buying second hand clothes, but there’s no need to! I love rummaging through charity shop rails because you just never know what you might come across. 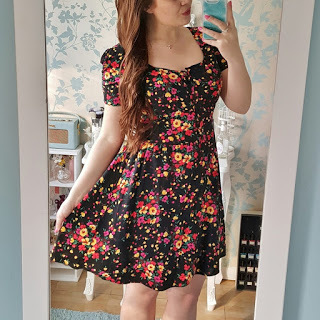 Sometimes you will just be unlucky and just find five year old overpriced Primark tat, but sometimes you can find some real treasures and it’s definitely worth the hunt! It can take a little bit of patience sometimes, and often you can spend all day bargain hunting and find nothing. But other days you can come out with armfuls of stuff for less than you’d usually spend on one item from a high street shop! And the best part is.. any money you spend will go straight to the charity running the store. Head for the posh part of town – I always find that I can pick up better branded buys from the ‘posher’ towns. 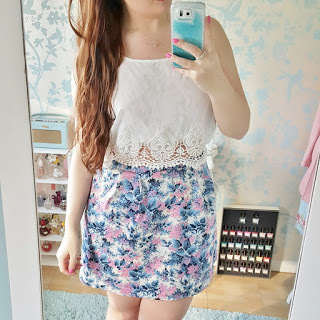 I once found a Calvin Klein skirt for £3 in one shop! Generally I find that the charity shops in cheaper parts of town tend to stock clothing that was cheap in the first place and now is just pretty much worthless. Close inspection – make sure you look over the garment first before making up your mind. If it’s damaged or marked; will you be able to repair it? Will the mark wash out or is it stained? I can tell you, it’s pretty disappointing when you buy something you love and then when you get home you realise it’s got a jammed zip or holes in! Generally most things are in very good condition as the volunteers work hard to make sure the items are wearable, but it’s worth double checking. Does it fit? – I used to get too over excited whenever I saw something I liked in a charity shop and hardly paid any attention to the sizing. But this ended up in me spending my money on things that I would never be able to wear because it was too small or too big and I’d never get around to altering it so it would just end up being sent back to the charity shop in my next clear out! Vintage sizing – If you come across some genuine vintage treasures, be aware of the sizes. 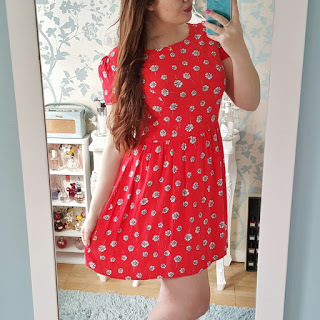 Over the years the ‘standard’ sizing of the general population has increased and therefore you might find that a vintage dress labelled a size 12 is actually more of a size 8-10 in today’s terms. Upcycling and accessorizing – You might find some garments that come in a beautiful fabric but they style just isn’t for you. If it’s a good price, why not buy it and then upcycle it into something more modern? In the past I have shortened dresses, created a cinched waist or turned a dress into a skirt. And don’t forget you can use accessories; for example you can always add a skinny belt to a large dress for an oversized look. 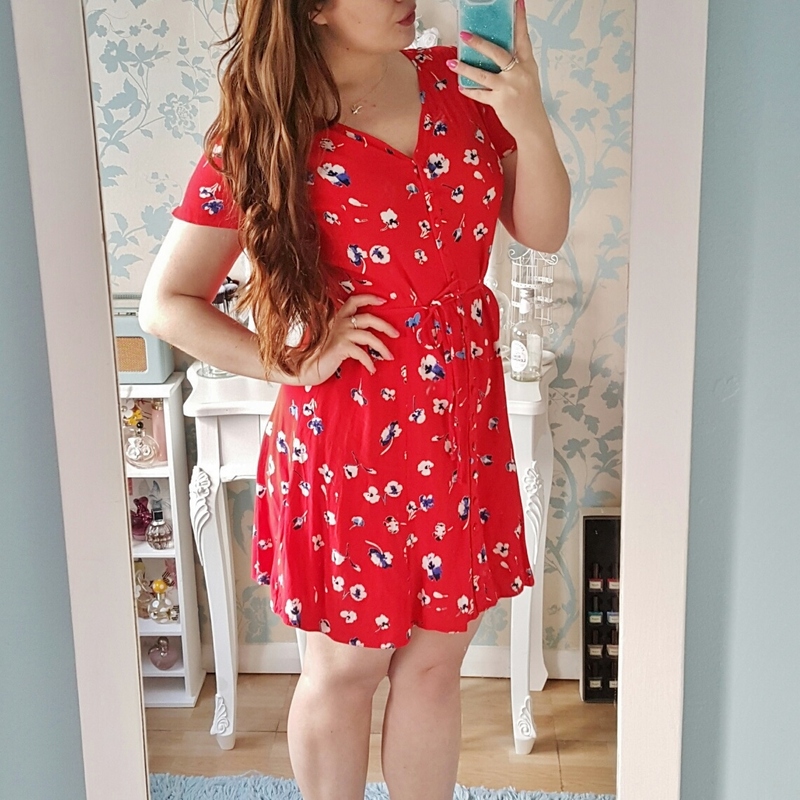 This cute red daisy print smock dress was originally £38 in Topshop but I found it for only £4! It had bobbled slightly, but I’ve found the quickest way to remove pilling is by going over the fabric with a disposable razor. Now it’s good as new! 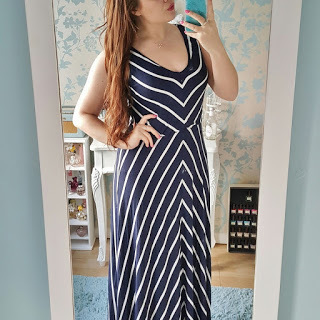 The navy blue striped nautical dress was £49 from Monsoon but I found it in a Scope store in Aylesbury for only £1! It’s a little bit too big for me but I plan to wear it with a skinny tan belt. I think it will be great to wear to work in the summer and I love the soft jersey fabric! The black spotty wrap dress is originally from Zara but I bought it for £6 from a charity shop. I love the long floaty sleeves and the plunging neckline. The red bird print dress is from Oasis for £32 originally and I picked it up for only £3.50. I absolutely love the bright colours and the shape of this one! 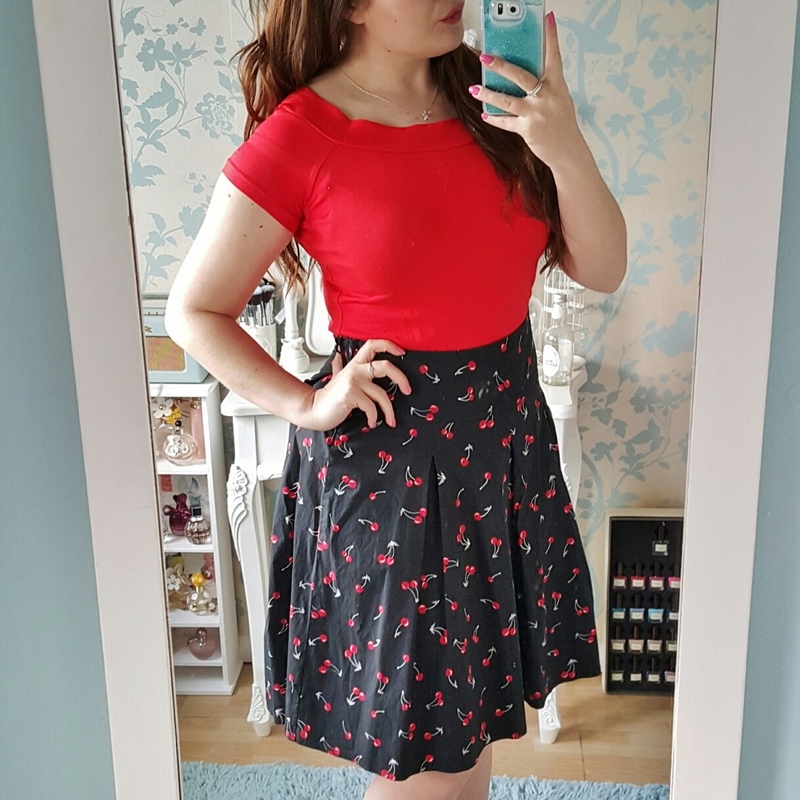 The cherry print skirt must be quite a few years old as it has an old style New Look label in it. But it was so cute I couldn’t resist it for £3! I plan on changing the waistline on this one so it sits more high waisted as in the photo as otherwise it sits very low on the hips. 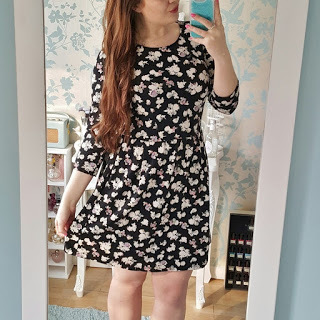 The black floral dress is one of my new favourites to wear to work. It’s originally from Next but I bought it from a charity shop for only £3! 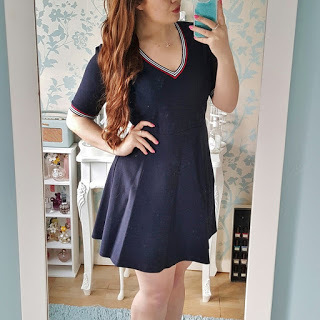 I love the length of this and the sleeves; and it also has practical hidden pockets! 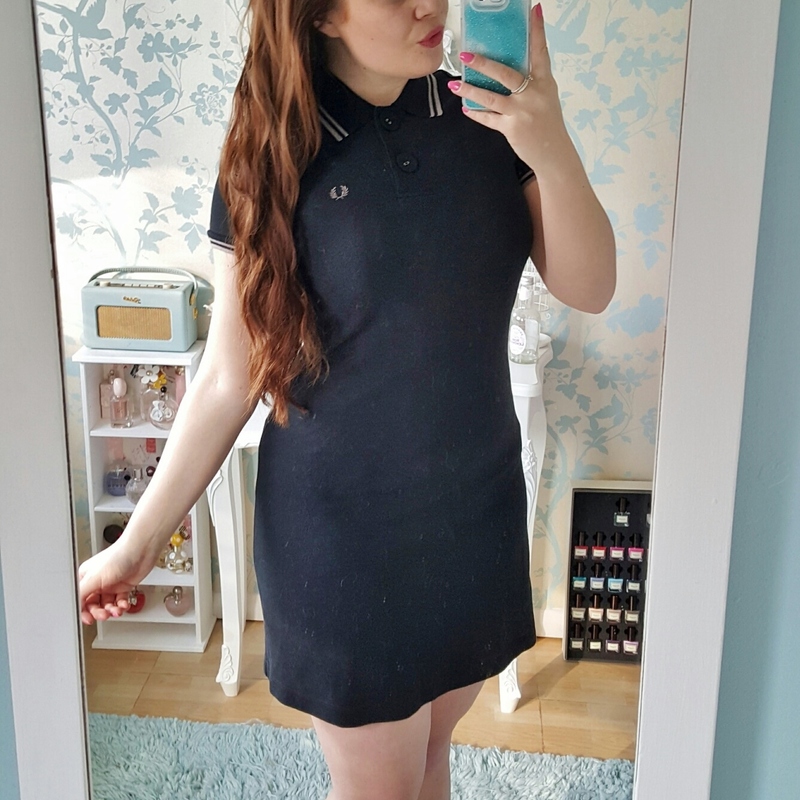 I wanted this sporty looking skater dress when I had originally seen it in H&M for £15 but I never went ahead and bought it (because I’m tight like that). So I was very happy when I found it brand new with tags in a charity shop in Knutsford for only £5 a few weeks later! 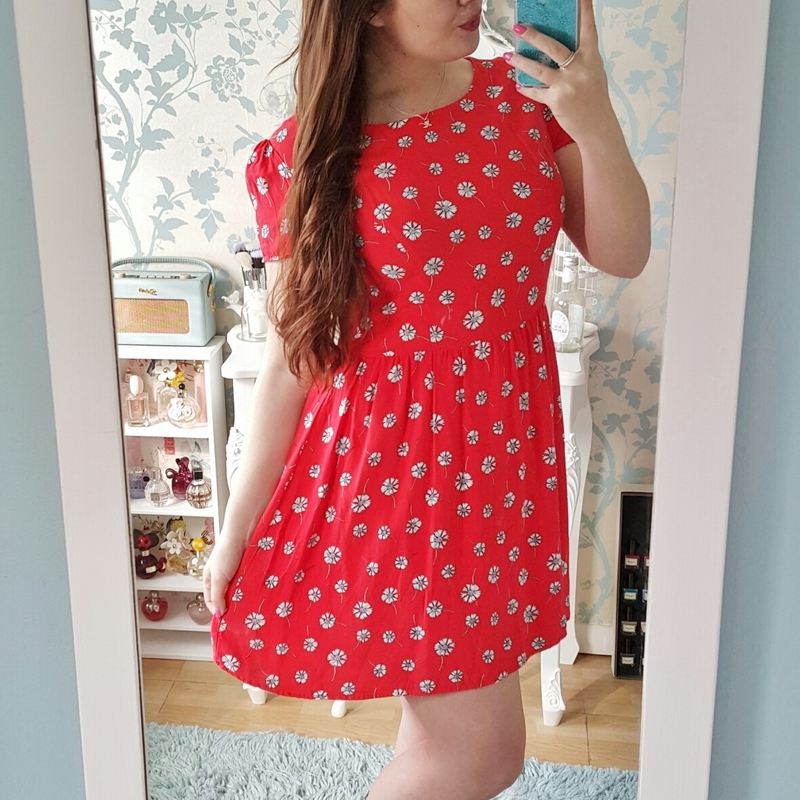 I think this cute red ditsy print dress is going to be my new favourite for summer. It’s a size too big for me, but I just tie the waist belt to the front instead of the back so it just looks a bit oversized. I love the shape and colours and everything about this one! I was really chuffed to have found this Fred Perry polo shirt dress in a charity shop for £7! I’ve always wanted a dress like this but never wanted to buy one at full price so I’m really happy with this. It looks brand new and unworn too. Who would just give this away?! They’re about £80 new! 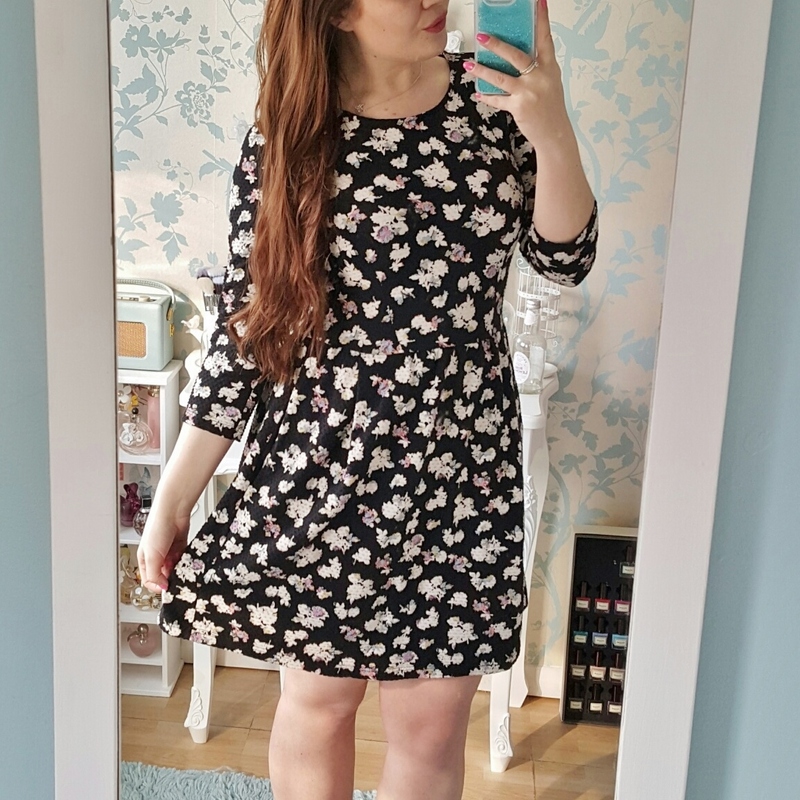 This black floral print dress is originally from Red Herring at Debenhams and I bought it from a charity shop in Ampthill for £3. I love the cute print, the shape of the neckline, and the little buttons up the front. This floral print skirt from Oasis was £5 from a charity shop and the original price was £40. 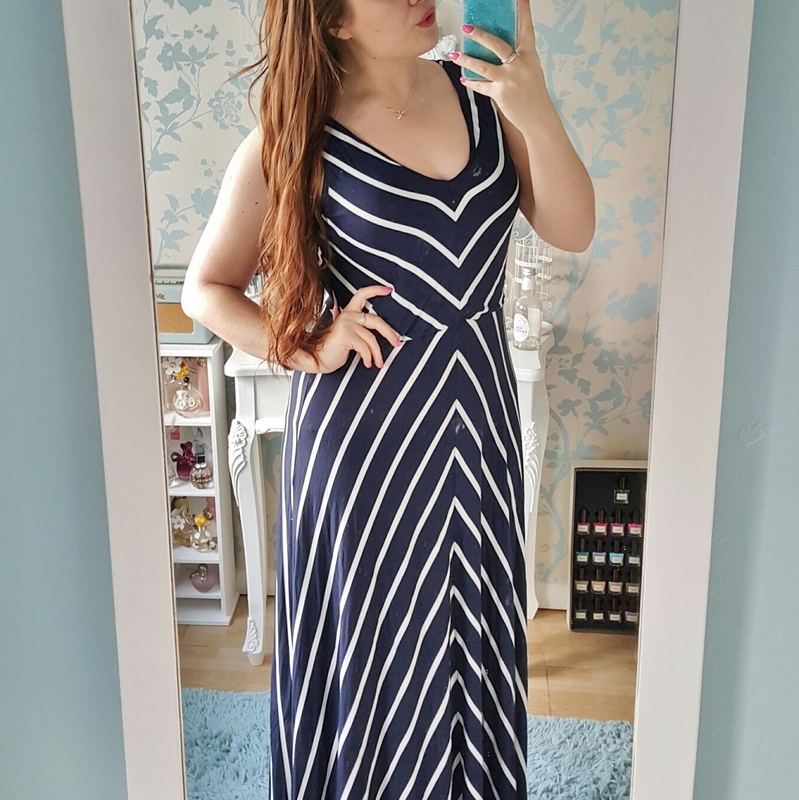 I really like the structured shape of it, although I’m not sure it’s very flattering on me! I like the bright pink and blue colours too. And finally, I found this cat cardigan in a charity shop in Bletchley for only £3. It’s a little bit hideous but also a bit cute so I bought it. I Googled the brand Antoni and Alison when I got home, and their knitwear sells for hundreds! What a find! 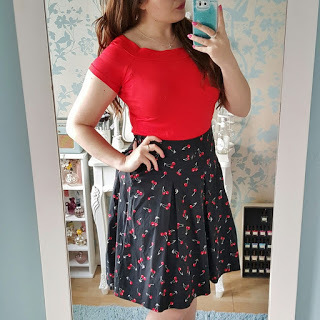 I had that red ditsy print one from F&F and I loved it but one of the front seams just kept bursting and after stitching it four times, I finally gave up and binned it. Gutted! Charity shops aren't placed I tend to shop, but the finds you've found are so great that I'm almost tempted to step into one and have a browse. I'm so pleased I came across this post! During my time at university my closest friend and I would love to do some charity shopping, I think I was only lucky sometimes in comparison to your finds. But you're so right about how to find things, making alterations and that the money goes to charity so it's all good even if you don't wear the clothes much in the end anyway. I think I need to get back into this type of shopping!? OOOOOh fab post and fab finds! I am well jealous. 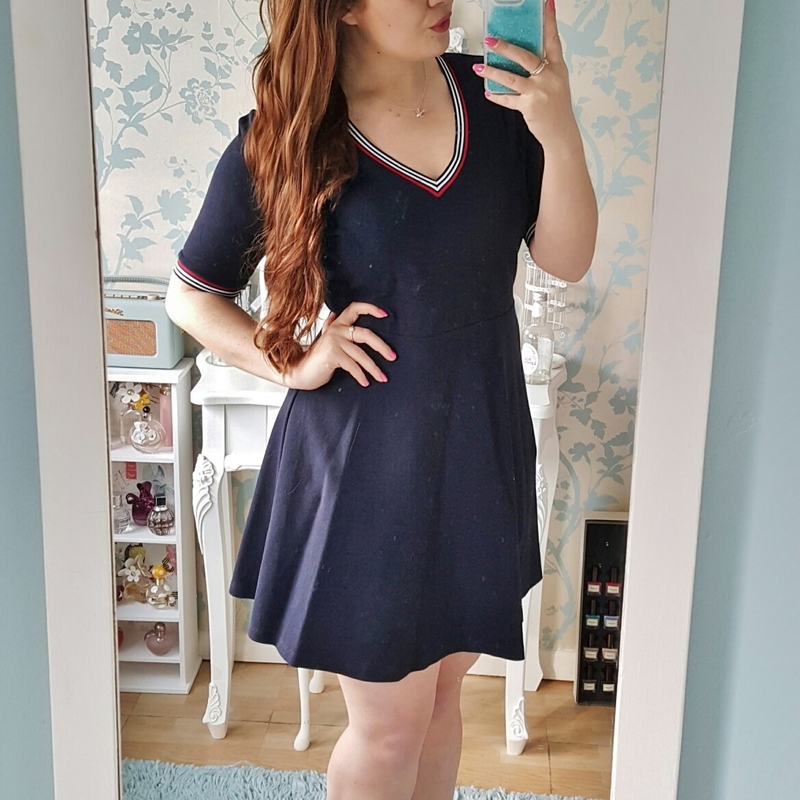 Being a plus size lass doesn't really give me much choice in clothes in charity shops, but when I find an item I love I am always over the moon! You have such amazing taste! You've renewed my belief in finding beautiful second hand clothing! Thanks for the great post.